How does the No Cost work? Normally, a mortgage loan will have closing costs associated with the transaction in the neighborhood of $3000 to $4000 or even more, depending on whether the borrower decides to pay points upfront. The way the no closing cost mortgage works is the lender gives Starwest Mortgage a broker rebate at closing, which Starwest then uses a portion to pay for all the closing costs associated with the transaction including, underwriting fees, processing fees, appraisal fee, title fees, and origination fees. None of these fees are rolled into the loan balance. Generally, most banks’ no closing cost loan structure corresponds with a slightly higher interest rate versus a standard closing cost loan. However, Starwest’s lender relationships and company volume allow the brokerage in most cases to offer no cost interest rates at the same or even lower rates than their competitors’ standard fee loans. Because Starwest does not include prepayment penalties on any of their mortgages, the no closing cost loan allows the borrower to take advantage of lower interest rates in the future, without paying new costs or foregoing the closing costs and points invested in the previous loan. Even in circumstances when the borrower has recently purchased or refinanced, he or she has the flexibility to take advantage of lower interest rates or change loan programs. How does the borrower decide if the no cost program is his or her best option? First, the borrower must determine how long he or she is planning on owning the property and if refinancing is a future possibility. Future financial flexibility is one of the main advantages of the no cost loan. Once the borrower reaches theoretical goals for the property, he or she can easily make the decision by calculating the break-even point and simply looking at the difference in payments for the no cost loan versus other closing cost structures, and then dividing that difference into the amount of total closing costs he or she will be required to pay at closing. The solution to this calculation will tell the borrower how many months it will take to re-coup the closing costs paid and truly realize the projected monthly savings. Obtaining a yearly break-even point is calculated by simply dividing the months to break-even by 12. If the borrower’s no cost loan includes an extra credit towards first month payment interest (prepaid interest) or escrows (property taxes and insurance), simply include the extra payment figure with the total closing cost amount before dividing by the payment difference. Below is an example table of no cost and cost loan comparisons using break-even analysis. 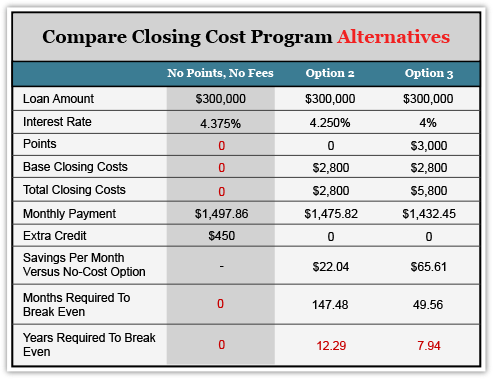 As this example illustrates, the no closing cost (No Points, No Fees) option provides immediate savings and the flexibility to benefit from future interest rate drops. Additionally, if down the road you decide to reduce your loan term, change programs, or take cash-out, the no cost loan allows you to do this without losing money invested in closing costs. Option 2, reflects Total Closing Costs of $2,800; therefore, you will not realize any savings by paying closing costs for a slightly lower interest rate, for 12.29 years. In Option 3, the sum of the Total Closing Costs equals $5,800 and corresponds with a break-even time of 7.94 years. Both of the closing cost option scenarios only make financial sense if you know for certain that you will be occupying the property for longer than these yearly break-even times. Only then, will you be realizing a return on your closing cost investment. Additionally, you will be ruling out the possibility of future refinancing or loan program restructuring flexibility for 12.29, or 7.94 years respectively, without losing money invested in closing costs. Please click here to calculate your personalized break-even analysis and determine the appropriate closing cost program for you. All 30-Year Figures Are Examples (Not Current Rates). Rates & Credits Are Subject To Change. Starwest Mortgage does offer all types of closing cost programs. The purpose of this example is to illustrate the differences between the closing cost options available, so the borrower can determine the situation that suits his or her financial goals. Most lenders do not provide the luxury of selecting closing cost alternatives. Frequently, Starwest will have additional rebates left over after all closing costs are paid. In this scenario, Starwest is passing through the leftover rebate to the borrower as an extra credit towards first month payment interest (prepaid interest) and escrows (property taxes and homeowners insurance). These extra credits vary per consumer, based on the loan size and the interest rate market conditions the day the interest rate is locked-in. Below are examples of a few of Starwest’s recent clients’ NO COST + Credit loans. Credit is NOT cashback from your loan balance, this is an extra credit from the lender.The credit CANNOT be given as cash at closing; credit may only be applied to prepaid interest or escrows. Credit amount varies depending on the rate, our costs, program, and day you lock.